NEWTON, Iowa—Ricky Stenhouse Jr. and Roush Fenway Racing teammate Carl Edwards insist they like each other. But for the second weekend in a row, they sure didn’t act like it. Saturday night at Iowa Speedway, Stenhouse and Edwards banged doors, fenders and feelings as they fought for the victory in the U.S. Cellular 250 NASCAR Nationwide Series race. Their final banging occurred a couple of hundred feet from the finish line on the last lap, and it produced a smoky, screeching, metal-bending finish as Edwards rammed Stenhouse’s car from behind and actually pushed it to the victory. “Wow,” both drivers said after climbing from their cars. Stenhouse’s car had blown an engine after exiting Turn 4 and had laid down a glaze of oil on the track. Edwards said he tried to go around Stenhouse but couldn’t as his car slid on the oil and his windshield filled with smoke. Stenhouse admitted to watching Edwards speeding up on him and then blocking his teammate. And then, Stenhouse thanked Edwards for smashing into the rear end of his RFR Ford. Edwards led 109 of the race’s 250 laps. Stenhouse led 25. Polesitter Elliott Sadler finished third, Josh Wise was fourth and Aric Almirola fifth. Rounding out the top 10 were Reed Sorenson, Kenny Wallace, Steve Wallace, Michael McDowell and David Mayhew, who was making his first Nationwide start. While the race-ending rear-end job by Edwards to Stenhouse was the final run-in between the two drivers Saturday, it was far from the first. They sideswiped each other about halfway through the race. 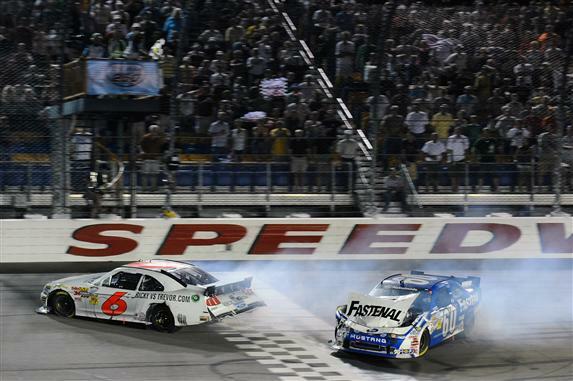 And then, after the final restart of the night with less than 25 laps to go, they went at each other several times before Stenhouse was able to break free. Their physical race at Iowa came a week after they frayed each other’s nerves and tempers at Lucas Oil Raceway in Clermont, Ind. Still, both said they hold no grudges against the other. “Ricky and I are fine,” Edwards said. “Jack (Roush, the team owner) came over and said, ‘Hey, this is exactly what’s supposed to be happening. You’re supposed to have a young guy who’s fast and is frustrating everybody because he’s too aggressive.’ Ricky, he’s really, really fast. Stenhouse, the Nationwide points leader, left Iowa with a 12-point lead over Sorenson. Sadler is third, 29 behind Stenhouse. Sorenson won the second of four NASCAR Nationwide Series “Dash 4 Cash” races, where a $100,000 bonus was on the line between him and three other eligible drivers. The next “Dash 4 Cash” race is at Richmond on Sept. 10.